There’s something new on my knitting radar: Eris. Oh, it’s making its way all around my Internet. There are blips at KR, whispers on blogs, a knitalong started by the fiendish Purlewe (She claims to understand the anguish caused by my Pile of Knitting, but what does she do? She starts up a knitalong for a sweater I must make, even though I have no business adding to the PoK). Seriously, this sweater is the perfect challenge for me. I enjoyed knitting Elspeth Lavold’s Herdis last year, and I’m working on a pretty simple pullover (the Fabuolus Manos Wildflower, etc. ), so I’m looking forward to tackling a complicated pattern. It follows the path my knitting has been taking in the past year or so. I see challenges in using techniques I already know — cables (I even like the complicated ones), raglan shaping — with elements that are not as familiar — short row shaping (except for socks, I’ve never really fooled with short rows), zippers (if I decide to make the cardigan version, that is). I‘m not shopping for the yarn yet, though. There’s far too much going on in my world. But knowing that I have Eris to look forward to makes me smile. This picture is for Vi, who thinks it’s high time I posted my progress on this scarf. This is the first half, and I’m knitting away on the second half now. I’m quite pleased with it, even in its unblocked, unfinished state. I’d be finished already, if I hadn’t made a gruesome discovery last week: a misplaced yarn-over right in the center of the central motif. Not acceptable. Even less acceptable was the way the edges would not look nice, no matter what I did to tighten them up. So I just picked up another ball of yarn and moved on. The edges are garter stitch this time around, and all the yo’s are where they belong, and I am much happier. I don’t hesitate to frog my hard work. If starting over is the best way to finish something, then that’s what I do. If I find a teensy mistake, something that nobody but me will ever see, or one that doesn’t affect the results at all, then I leave it alone. I fix what I can, and keep knitting. I’m still pondering the Great Question: Why I Don’t Spin. The answer won’t matter before long. I’ve been a spinner longer than I’ve been a knitter, but not as long as I’ve been a weaver. [Can I still call myself a weaver? I can if I want to.] I set the wheel aside to make room for the many changes my life was experiencing, but it has never left my side. It waits, it knows I haven’t stopped being a spinner, and it will be ready when I am. I love my spinning wheel, love it in the way one loves a dear old friend whose shoulder is always available, and whose confidence is the safest place in the world. Nothing is stopping me from seeking solace there, nothing emotional or fearful or whatever-ful. I haven’t put it away from my sight, or sold all my wool, or stored the bobbins and oil. Knitting has been my passion for the past few years, and there has been strength and comfort to be found there, too. I would not be This Jane without the knitting, without its daily presence, without the challenges and accomplishments it’s provided. Now there might be spinning to be done, because I happen to have a bag of some beautiful wool that I bought at Rhinebeck two (or three?) years ago, “just in case.” We know what that means, don’t we? ok darlink…….thou is forgiven cause I am now drooling all over my chin ( which thanks to mengele is now down to ONE)I want that pattern it is to die for and the color looks purple to mine olden eyeballsviwiping the drool now…..
That is really a beautiful pattern Jane. I hope that you knit it so that you can tell us all about it. You should listen to your wheel, as well. There’s something that spinning can do for you that nothing else even touches. All of your knitting is amazing and beautiful. That is a beautiful job, Jane — worth getting right.About your Crest of the Wave Scarf — where did you get the pattern. Yours looks quite different that the Heartstrings one (the only Crest OTW pattern I’ve seen) – and I like your scarf better. 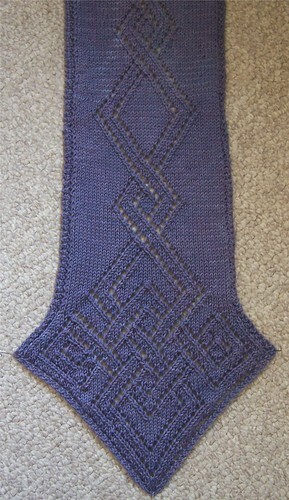 Also, your lovely mohair varigated yarn scarf — can I ask what pattern that is.Again, lovely work.